A Happy Halloween to everyone! Not much going on for me. I worked today and I'm alone until late this evening as Anthony and Kyndra went to visit his grandpa as it prolly won't be long before he leaves us. Even our dog Coalee is with them. So unless the mouse that has been hiding somewhere in our house decides to come out it should be pretty uneventful. Rachel over at Triplet Butterfly Wings released a butterfly for Carleigh. Thank you so much Rachel! Onto the winners of the My Forever Child lapel pins! Thank you to everyone who left a comment and to everyone who participated in the many giveaways for Pregnancy & Infant Loss Awareness Month. 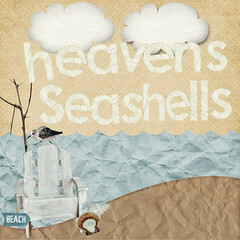 I thoroughly enjoyed giving away all the items to remember your precious babies. I think I may do another giveaway next week with a little twist so watch for that. Congrats to Ali @ A Beautiful Disaster for winning the silver pin! Congrats to Jennifer @ A walk with the Doiron's for winning the gold pin! Please email me your contact info at caring4carleigh@yahoo.com and to also confirm. I woke up this morning and got ready for work. I drove your sister to the sitter's. I listened to KLOVE while finishing my drive. I got to work and walked inside. The morning was busy like it always is. I got free popcorn when I got my lunch. I watched Lindsey's baby on the ultrasound. I left work and went outside. The air was warm with a gentle breeze. I picked up your sister and hugged her tight. We went to the cemetery because it was so nice out. We laid in the grass and laughed by your stone. We drove home and sang sweet songs. I put your sister down for a nap. She woke up and we played with toys. Daddy will come home very soon. I'll be thinking of you then. We'll eat supper and watch tv. I'll take a bath and get ready for bed. I'll say a prayer and go to sleep. With every action your on my mind. I left work early today so that I could make it to our small town post office before it closed. I knew that I had a package and I wanted to get it. I figured the package would be the non-personalized jewelry from My Forever Child that I have given away and not yet given away and I was right. But I also got a special surprise. Today it's been 7 months. Kyndra was excited as always to go to the cemetery. I asked her if she wanted to go see Carleigh and she said "yeah" and said Carleigh's name in her cute little way. She said it the best she has so far. It kinda sounded like "Cahr-kee". Just melts my heart! Once we got to the cemetery, she went right to where Carleigh is. She wouldn't even stop to let me give her Carleigh's pumpkin! When I gave her Carleigh's pumpkin I had to snap a few pictures of her with it. We walked around the cemetery a little bit with the pumpkin. We covered so much ground in that little cemetery that I was able to find 23 graves of babies. A couple were 2-3 years old. And that's just the stones I was able to read. The cemetery has a section of really old graves that you really can't read too well anymore because of wear and moss. Kyndra sure had a lot of fun exploring. She picked up a few nuts and leaves along the way. I finally decided it was time to go so we went back to Carleigh and Kyndra (reluctantly) gave her the pumpkin. She really wanted to leave with it but I told her it had to stay. I actually had to put her in her car seat and take the pumpkin back because she wanted it. 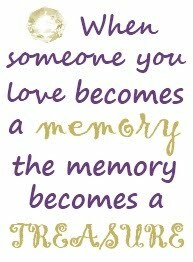 Happy 7 months in Heaven, Carleigh! We love you and miss you! Congratulations to Kristin @ Once A Mother!!!! Thanks to everyone who entered!!! Kristin has won the Pink and Blue Crystal Ribbon Charm Necklace from My Forever Child. Please email me your contact info at caring4carleigh@yahoo.com and to confirm. I hope you enjoy your necklace!! It looks like I can do one more giveaway for Pregnancy & Infant Loss Awareness Month. I will still have a few things left but I can hold onto them for in the future (like Christmas?). This giveaway is for the My Forever Child Lapel Pin in Silver and in Gold. So there will be 2 winners!! The giveaway will run until Friday at 11:59 pm EST and the winner will be announced on Halloween. All you have to do to enter is just leave a comment. If you leave a comment you will be entered. Here we go! Our second Wednesday for Wyatt! It’s quite simple to participate. 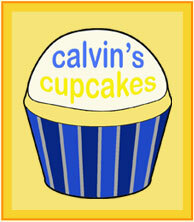 All you have to do is copy and paste this post on your blog, and come back here to link up with MckLinky! Once you do that, your all set to win a great giveaway. Kristi, on of the dear women who follow my family's story has generously donated some handmade buckeye's jewelry. Thank you Kristi! Over the last week we have gotten 123 new signatures! Over 100 of those we got last Wednesday alone. And we had 34 wonderful bloggers link up... 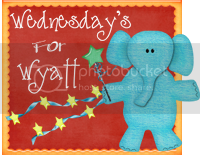 I can't wait to see how much Wednesdays for Wyatt will grow this week! This weekend I met up with some wonderful babylost moms. Jenny (mommy to Kayden), Danielle (mommy to Wyatt), Nicole (mommy to Logan), Mary (mommy to Amiee), Mary Ellen (mommy to Grace), and myself came together with our families and had lunch together. I originally planned for Anthony and I to go down and visit the National Memorial for the Unborn and then it turned into so much more. Before lunch, several of us met up at NMU and spent some time there. Our kids sure enjoyed playing together!! The items we left at last year's visit, which includes a stuffed animal, a certificate of life, and my poem that I wrote. Jordan's plaque on the wall. Anthony, me, and Kyndra standing with Jordan's plaque. After we were done at NMU we went to The Acropolis to eat lunch and meet up with everyone else. I wasn't sure how it was going to go since I hadn't met most of these people except for Josh and Jenny, but I had a good feeling after meeting Mary and Nicole at NMU. Everything flowed when we were all together. There were no awkward moments and it felt like we had always known each other. Our time together went by so fast. It was hard to believe we were there several hours. I wish we would've had more time! We ate lunch and just talked. We talked about our babies and shared pictures and keepsakes. (I brought my massive scrapbooks. I stayed up until 2 am before coming to Chattanooga to finish it.) We are forever connected by our sweet babies. I was so happy to finally meet these mommies in person and I definitely want to get together again. Danielle has some great pictures on her blog from that day. I was also able to visit with a few moms that lived in the area. Sandie and Erica were in the same due date group (April 2009) on Cafemom as me for our babies. It was so nice to meet and visit with them!! Dana is a spectacular artist with a shop called The Midnight Orange. Stephanie @ My Very Own Angel had a giveaway and Dana generously gave a sculpture to each person that entered. Today I got my sculpture in the mail. It is so beautiful and I love it!! I love how the little angel baby is reaching up to the mommy and the mommy is lovingly holding her baby. Thank you so much Dana!! I've looked on The Midnight Orange and there are many other pieces that are simply amazing. Of course, my favorites ones are the angel sculptures. If you'd like one, feel free to stop by and let Dana know! I know she would be very happy to help you! Congratulations to Nicolle @ Missing Kasey!! Nicolle said... "Now that I think about it I have more than I thought I did! I have pictures, his blanket, socks that he was wearing/ laying on when he grew his wings. We also have molds of his hands and feet. I sleep with 2 of the small pieces of fabric that they put over his eyes too." Nicolle has won the Small Birthstone Suncatcher from My Forever Child. Please email me at caring4carleigh@yahoo.com with your contact info and to confirm. Thank you to everyone who shared about keepsakes!! Thank you to everyone who has entered all of the giveaways so far and congrats to all the winners. October is coming to an end but I still have a few more giveaways for Pregnancy & Infant Loss Awareness Month. This next giveaway is for a Pink and Blue Crystal Ribbon Charm Necklace from My Forever Child. The charm will come with an 18 inch sterling silver box chain. This necklace is perfect for raising awareness of loss. This giveaway will run until Wednesday at 6 pm EST with the winner announced that evening. To enter, just leave a comment. Any comment will do!! If you do not want to be entered into this giveaway do not leave a comment!! 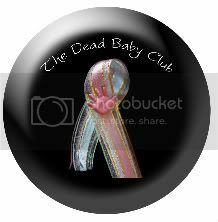 Thank you to everyone who said they wanted entered to win the Pregnancy-Infant Loss Support Ribbon Suncatcher from My Forever Child. I had 13 entries. Sorry I didn't put this up yesterday. I had a fundraising banquet for my local women's center and didn't get home until after 10 pm, which is late for me! I was so tired! 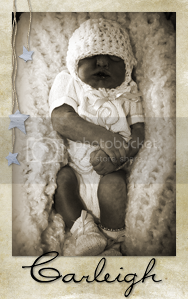 Congrats to Mary @ Our Angel Amiee!! Mary, I hope you enjoy the suncatcher!! Email me your contact info at caring4carleigh@yahoo.com and I will get your suncatcher to you!! I've got another suncatcher giveaway from My Forever Child! You have a chance to win a Small Birthstone Suncatcher. This suncatcher will come with a clear crystal angel charm and then you can choose what Swarovski Crystal birthstone color you would prefer. This giveaway will run until Sunday at 6 pm EST with the winner being announced that same evening. 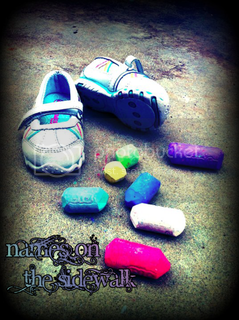 To enter this giveaway leave a comment telling me what your favorite keepsake is of your baby. 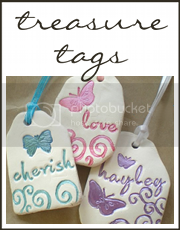 If you don't have a keepsake, leave a comment telling me what keepsake you would most want if you could have one. Do you ever notice that when the weather is nicer your mood is better? Today the weather was incredible!! It was near 70 degrees F today with the sun shining brightly and the wind blowing lightly. It was just wonderful to walk out of work and be greeted by the warm sunshine and the colors of fall. It was so nice that I couldn't pass up the opportunity to go visit Carleigh. It's time to announce the winner of the Pregnancy-Infant Loss Personalized Bracelet from My Forever Child. All entries that had a happy moment were counted. There were a total of 20 that shared. Congratulations to Jen @ attempting to love life without her!!! Jen said.... "I am fortunate that I have several good memories with Ella.. MY last really good moment was on the way to the hospital after her mickey was put in..she was starting to have seizures.. I held her in the back seat of the car and she reached up and was playing with my hair and smiling..WHILE having a seizure (at this point it was just starting) she was so sweet and so precious.. when we got there she worsened and was never herself again.. but that last moment when she recognized me, its the best..."
Jen, please email me your contact information and what you would like the sterling silver bead to be personalized with at caring4carleigh@yahoo.com and I will forward the information to Sue and she will get your bracelet to you. Thank you to everyone who shared their happy moments. I enjoyed reading every one of them! Hey, guess what! I am sneaking another giveaway in right now!! 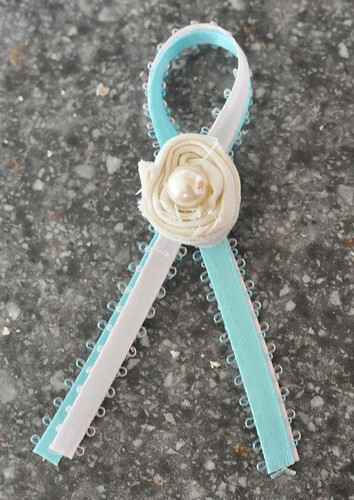 This giveaway is also from My Forever Child and it is for a Pregnancy-Infant Loss Support Ribbon Suncatcher. Suncatchers are perfect for hanging in your car. Both my husband and I have one and have put them in our cars. There is nothing special you have to do for this giveaway except for leaving a comment telling me you want to be entered. This giveaway will end tomorrow at 5 pm!! So this giveaway is only for the next 24 hours!! And in case you are wondering, "why all the giveaways?" Because as a babylost mom, you deserve something special and I thought Pregnancy & Infant Loss Awareness Month would be the perfect time to give away items to help remember your baby and to thank you for all of your support! Please watch out for even more giveaways too! There aren't many days left in October and I have to fit them all in!! Remember that God loves you and so do I!!! Today is the very first post for Wednesdays for Wyatt! It’s quite simple to participate. All you have to do is go to Danielle's blog and copy and paste her post to your blog, and then link up with MckLinky! Once you do that, you are entered in the Wednesday’s for Wyatt giveaway. Let make this a huge success, shall we? We are currently up to 1,253 signatures. Hurray! We’ve made it over my initial goal of 1,000 signatures, and now I’m dreaming big! You think you can help me get 5,000 signatures by Thanksgiving? I bet you could, and I hope this Wednesdays for Wyatt helps out tremendously. Post this to your blogs, facebook, myspace... wherever you can think of. I can’t wait to see how many more signatures we receive from this. I have a great feeling! The contest will only be open today. You have until 11:59 pm to post this on your blog and come back here to link up with MckLinky in order to qualify for this Wednesdays for Wyatt giveaway. Good luck everybody and thanks for participating. After my post about me and crowds, a friend messaged me (you know who you are and thank you for all of the support you've given me) and told me it sounds like I might have PTSD. She told me that her husband, who served in Iraq, is the same way with crowds and anger. Honestly, I haven't given it a single thought. It never crossed my mind that I could be suffering from it. Is this PTSD or just normal grieving?? Going through the symptoms of PTSD, I am thinking I may fall under the category of normal grieving. Perhaps some of my actions could be considered PTSD? Do you have to have a certain number of the symptoms to have it or just one? I've heard moms say that around 6 months things can get harder. I've been doing pretty good so far, but things have definitely been a little tough lately. 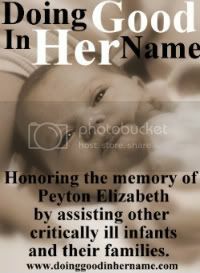 Maybe it's because I'm not just missing my daughter, but that I am grieving for the 6 month old that isn't here. The 6 month old that I will never know and the milestones she will never achieve. Lately, the tears come a little easier but so do other emotions I would rather not, like frustration and anger. I've been doing so well (in my opinion) these months since Carleigh has been gone that I'm afraid of taking a step back. I don't want to be an emotional mess. I want to continue being happy. It was just a year and a half ago that I was suffering from PASS. It's a place I don't want to revisit. The person that existed then didn't feel like me and I am thankful that I have experienced peace, healing, and forgiveness in this area of my life. God and counseling got me out of the dark hole I was sinking in. I think that part of my life has helped me in dealing with my journey with Carleigh. There's no way I can sink any lower than dealing with the reality that I paid someone to kill my own child. I've been spending some time in Proverbs lately thanks to my cousin Kate. She is leading a few of us in reading through the book of Proverbs on her ministry blog. I am glad I am reading along with her. There are so many great verses in Proverbs that have encouraged me. I need to spend more time in the Bible and in praying. I don't want to go through the motions and lately it feels like I have. Lynnette shares with us the night before and the night that Anna passed away. Some of this section was shared in the Prologue of the book, so it was already familiar to me. I can only imagine how agonizing of a time this was for her and her family. I think that it was a blessing that they got such a perfect evening with her before she went to be with Jesus. I'm so glad there were many people there to support them through such a difficult time. I like that the children's friends kept them occupied. I think it is sweet that Anna wrote those little notes. I am sure it is a treasured keepsake!! Planning for your child's memorial isn't easy and I could really relate to Lynnette when she said that she didn't have time to be sad because she was busy working to get everything around. I felt the same way. I wanted everything to be perfect and be a wonderful celebration of her life. I think both Lynnette and I achieved that. There are many people that care for and love me and as long as I have their support then that is what matters. As long as God is on my side nothing can be against me. Heather F., who lives in Canada, sent me a photo of Carleigh's name in the sand at Old Orchard Beach in Maine. Thank you Heather!! 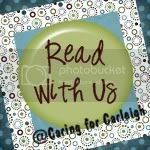 In case you are new to Carleigh's blog, I have had wonderful people and friends send me photos of Carleigh's name. Many of these pictures her name is written in the sand, but some are not. They are all very special. Once I finish Carleigh's final scrapbook, these photos (and mementos to these photos) will be going into a scrapbook solely dedicated to her name. Thank you to everyone who has sent me a photo or memento with her name. Your kindness will forever be remembered in this book.